Honda is the world’s largest manufacturer of two Wheelers the ‘Wings’, recognized worldwide as the symbol of Honda two wheelers, which arrived in Nepal in 1968 A.D. Jyoti Group of Companies initiated the distribution of Honda motorcycles by importing 11 units. Syakar Trading Company Pvt. Ltd. (STC), one of the companies under Jyoti Group of Organization, which was formally known as Syakar Company Ltd (established in 1976) is now the sole authorized distributor of Honda Motorcycles & Scooters, Honda Cars, and Honda Power Products in Nepal. The company officially changed its name to Syakar Trading Company Pvt. Ltd. on June 7, 2011 (Jestha 24, 2068 B.S) and became a 100% subsidiary of Honda. From importing 11 units of Honda Motorcycles at the beginning till now, Syakar Trading Company has lived up to its reputation of offering highest quality motorcycles & scooters and now imports almost 60,000 Honda Motorcycles & Scooters every year. Thanks to its ever-growing customers, Syakar Trading now has more than 70 Honda 2-wheeler outlets all over Nepal. Syakar Trading Company started the 4-wheeler business from 2002 A.D. 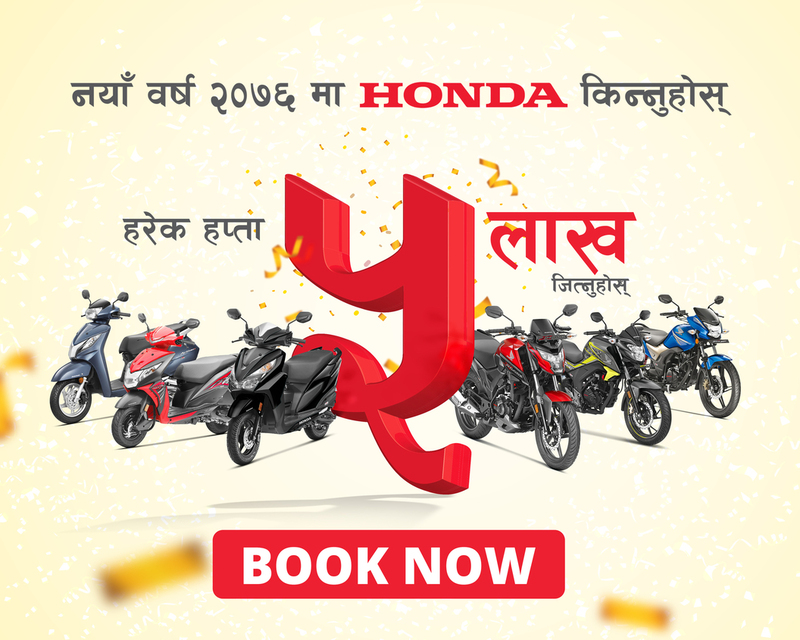 Since the inauguration of Honda Cars’ first showroom at Dhobighat on April 20, 2002, Syakar Trading has added 8 more Honda Car Showrooms all over Nepal and has been delivering quality products to all of its customers. Honda has been committed to spreading mobility through society while promoting traffic safety for every individual. With this fundamental belief, on March 23, 2010, Syakar Trading Company Pvt. Ltd. inaugurated ‘Syakar Safety Riding Training Centre’- the first and largest motorcycle training institute with an area of 10,200 sq.m at Gwarko, Lalitpur. The motorcycle training institute has been developed under Honda Motors Japan training standards and is well equipped with well-trained male and female Safety Riding Instructors and sufficient amount of safety gears. The newly generated trial for getting motorcycle license has also been implemented at Syakar Safety Riding Training Centre.